World Courier provides time and temperature-sensitive transportation services to the pharmaceutical industry. 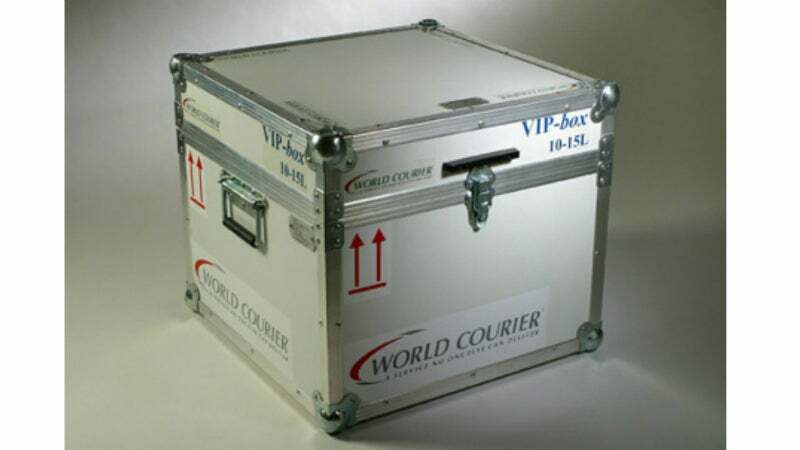 Relying on its own international network of over 150 company-owned offices in more than 50 countries, World Courier works closely with customers to ensure regulatory compliance and supply chain integrity, as well as to identify and deliver the best logistical solutions for each individual study or shipment. Following an extensive review of international good practice (GxP) and quality management standards, as well as the successful implementation of company-wide compliance processes in 2009, World Courier meets all current standards for GxP compliancy as it applies to the courier / transport industry. Each World Courier office is also ISO 9001:2008-certified and maintains its own IATA-certified dangerous goods team. World Courier is dedicated to treating every shipment on an individual priority basis, delivering customised solutions and value-added services to the pharmaceutical and biomedical industries. In 2012, World Courier was acquired by AmerisourceBergen Corporation, one of the world’s largest pharmaceutical services companies. Serving the US, Canada, and selected global markets, AmerisourceBergen provides a suite of value-added services that focuses exclusively on enhancing the effectiveness of the pharmaceutical supply chain. With a fully GxP-compliant transport and storage supply chain system in place, World Courier meets the most demanding industry expectations for managing time and temperature-sensitive clinical trial materials. Every shipment, whether containing biological specimens, investigational drugs, vaccines, or other delicate pharmaceutical products, is handled on an individual basis by highly trained personnel. World Courier operates 13 ISO 9001:2008 good manufacturing practice (GMP) compliant investigational drug storage depots in Latin America (including Argentina, Brazil, Chile, Colombia, México, and Perú), Europe (Russia), Africa (South Africa), and the Asia Pacific (including Australia, China, India, Japan, and Singapore). Leading pharmaceutical companies worldwide rely on this sophisticated investigational drug storage network to dramatically improve clinical trial logistics in challenging and strategic regulatory environments. World Courier also offers sophisticated temperature-controlled transport services designed to minimise the number of temperature excursions faced by researchers, an area now increasingly scrutinised by regulators. Offered on-site, off-site, or via a distance-learning video, World Courier delivers one-day dangerous goods courses designed specifically for pharmaceutical professionals who handle biological specimens. Climate-controlled transport awareness training is now also available to customers in various markets. World Courier has announced the opening of four new offices in China, the Philippines, Lithuania and Serbia. Of historical global pharmaceutical industry statistics, two in particular stand out. Brazil, Russia, India, and China (BRIC) nations accounted for $2.68bn in sales for 2016, and $8bn was spent on cold chain logistics globally in 2014. World Courier understands the importance of cell and gene therapy logistics and is able to address critical issues. World Courier drives improvement in the transitioning logistics market with innovation, value creation, and flawless execution. Supply chain optimisation and operational efficiency demand more than just safe and timely transport. World Courier helps ensure products and samples are delivered on time and in optimal conditions. It also provides the clinical development community with services that enhance the performance of their research and development (R&D) investments. For most sponsors and physicians running clinical trials, patient recruitment and retention is a major challenge. In-transit temperature control for pharmaceutical products faces increasing regulatory scrutiny in addition to the ever-present risk to product integrity. This PCM panel could play a role in curing cancer. Preconditioned in offices worldwide, it is one of thousands that can be used at a moment’s notice for the safe transport of clinical trial drugs. With a fully integrated GxP-compliant transport, storage and distribution system in place and more than 140 wholly owned ISO:9001-certified offices in more than 50 countries, World Courier, is the world's largest and most experienced provider of specialty courier services. Are you certain that your logistics provider can effectively respond to the many unexpected occurrences that threaten to disrupt your carefully conceived budget and timetable? The globalisation of clinical trials and specialty pharmaceutical commercialisation, along with the rise of complex biological-based drug therapies, present a host of opportunities for manufacturers. Contingency planning is the process that prepares us individually, corporately and on a local and global level to respond coherently to an unplanned event. Who knew clinical trial logistics had so much in common with the automotive and high-tech industries? That certainly seems to be the case with trends such as just-in-time (JIT), customer-managed inventory (CMI) and vendor-managed inventory (VMI). As the pharmaceutical industry's global development accelerates, demands on temperature-controlled shipping are increasing. World Courier is hosting a joint webinar presentation at 3pm (GMT) on 9 December with Nils Markmann from World Courier and AmerisourceBergen's Paul Ross. World Courier has announced the opening of a new facility in Gothenburg, World Courier's second office in Sweden, on 1 March. World Courier has announced that Clinical Trial Supply Chain Services (CTSCS) has been rebranded as Clinical Supply Solutions (CSS). World Courier today (24 January) announced that World Courier Italy has been accepted as a member of the Italian Association for the Development of Biotechnology (Assobiotec) after a challenging election process. World Courier has announced the upcoming expansion of the World Courier Ground Europe (WCGE) fleet. World Courier today announced that they are in the final stages of creating a new facility in Wales, with the support of the life sciences division of the Welsh Assembly Government, to support existing Welsh clients. World Courier has announced that the company's operations are in full compliance with the recently issued Good Distribution Practice of Medicinal Products for Human Use (GDP) guideline document (2013/C 68/01) in the European Union (EU). The Central Drugs Standard Control Organization (CDSCO), the national regulatory body governing pharmaceuticals and medical devices in India, issued draft guidelines earlier this year designed to ensure the quality and identity of pharmaceutical products throughout the distribution process. World Courier is pleased to announce the December 2012 opening of its newest office in Innsbruck, the company's third office in Austria and 152nd in its global network. World Courier is pleased to announce the November 2012 opening of a new office in Basel, Switzerland − the company's third office in that country, bolstering the company's global network to 151 offices in 52 countries. World Courier is pleased to announce that its newest clinical trial supply chain services (CTSCS) investigational drug storage depot will open in May 2012 in Buenos Aires, Argentina after having moved to larger purpose-built premises in response to strong customer demand. World Courier (India) Private Ltd.
World Courier del Ecuador S.A.
World Courier de Espana S.A.
World Courier Singapore Pte. Ltd.
World Courier Tasimacilik ve Loj. Hiz. Tic. Ltd. Sti.